With the steady incline in the usage of electronic equipment among humans to improve comfort levels, energy consumption is seen to pick up pace exponentially. Energy is a precious resource which forms the entire backbone of our human civilization and if not used wisely can end up causing disastrous after-effects. However, even with all the types of equipment and its subsequent usage, there are several methods to save energy such as the use of energy efficient devices which results in minimal energy consumption. All the equipment manufacturers are obliged to label their product with its energy consumption in the Indian market, but for an average consumer, these numbers don’t make any sense. That’s where the Bureau of Energy Efficiency (BEE) came up with a simpler star-based rating system making it easier for the end consumers to be informed about the energy efficiency of the appliance they’re about to purchase. 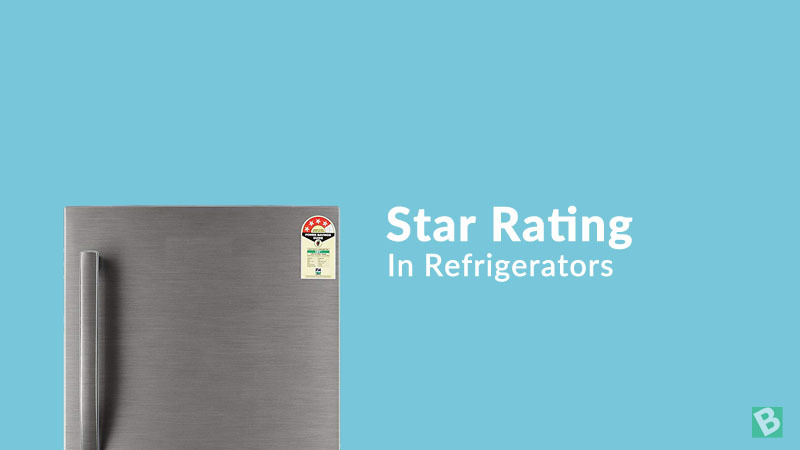 In this article, we’ll discuss in detail about these star rating systems and how much you should rely on them for your next home appliance purchase. The ultimate aim of energy conservation is to minimise energy wastage. There are several methods for this namely improving the efficiency of the equipment and using alternate renewable sources for energy for powering them. India being a relatively large country with a huge population, the energy from renewable sources is not alone sufficient. That’s why we are forced to rely on nuclear and thermal power for our energy needs. This doesn’t come cheap and has its own adverse effects on the environment. In order to curb these after effects, the Indian government enacted the Energy Conservation Act in the Indian parliament in 2001. After a year later in 2002, the Bureau of Energy Efficiency (BEE) was set up under the ministry of power. One of the primary functions of BEE was to set minimum performance standards and labellings for electronic equipment and buildings. Star labelling is an energy efficiency rating scheme for electrical equipment and buildings. It grades home appliances and buildings in terms of energy efficiency on a scale of 1-star t0 5-star, one star being the least energy efficient and 5-star being the most energy efficient. This system standardizes the energy efficiency ratings of different electrical appliances and buildings under a standard set of test conditions. Minimal energy utilization for an overall better quality environment. Air conditioners are one of the fast selling home appliances currently in the Indian market. Let’s take a quick peek at the star rating systems of air conditioners. Earlier the star rating of air conditioners was based on the EER (Energy Efficiency Ratio) but has since changed to the basis of ISEER (Indian Seasonal Energy Efficiency Ratio). Energy Efficiency Ratio is defined as the ratio of the amount of heat removed by the AC per hour to the power consumed by the AC in that hour. However, in India, the temperature drastically varies with the season and the BEE revised the calculation of star-based energy scale to be based upon ISEER. ISEER is defined as the ratio of the amount of heat removed by the AC per year to the power consumed by the AC in that year. More the ISEER, higher is the number of stars resulting in better energy efficiency. ISEER (Indian Seasonal Energy Efficiency Ratio) and its respective star ratings are different for different appliances. Here is a table with star ratings and its respective ISEER values of a window AC. In the case of Split ACs, same star ratings have higher ISEER values which mean better energy efficient they are. Comparing the two tables, we can see that a 3-Star Split AC is more energy efficient than a 5-Star Window AC. So when you buy an Air Conditioner, don’t rely only on star ratings, but also take a look at its respective ISEER values. Install your air conditioner on the shady side of the building and make sure the airflow around it isn’t obstructed. Always prefer a higher star rated air conditioner than a lower rated one. Although higher rated air conditioners are a bit more costly than lower rated ones, the energy conservation that they provide will act as a profitable investment in the long run. Energy saving tips by the Bureau of Energy Efficiency India. The star-based system for calculating the energy efficiency of television in India is based on the Maximum Annual Energy Consumption expressed in kilowatt-hours per year (kWh/year). Lesser the AECmax (maximum annual energy consumption) more will be the star rating and better will be the resulting power efficiency. The energy consumption on televisions primarily depends on its display type and the size of the display. In the past, CRT televisions were so popular among the public. But these televisions used vacuum tubes and electron guns to illuminate the screen, consuming a lot of energy which led to the increase in electricity bills. The advent of LCD and LED televisions brought down energy consumption significantly. The main factor to take note of while purchasing a television as of today is determining the type of display – whether it is LCD or LED. LED televisions are much more energy efficient than LCD televisions. This is because, in LCD TVs, a separate light source illuminates the screen while in LED televisions, the LED lights up directly saving a lot of power. So even if the initial cost for an LED TV is a couple of thousand rupees more than the LCD counterpart, it’s definitely worth it in the long run. The energy consumption is also directly proportional to the size of the display. Larger the display, higher is the number of pixels which requires lighting up leading to higher energy consumption. The size of the television is a highly subjective factor. If you are planning to install a large 55-inch TV in a small sized room, it’s a futile exercise. Neither the viewing quality will be optimal, nor power consumption. The standby electricity consumption also plays an important role in determining the star rating of a television. LED and LCD televisions use less than 0.8 W in standby mode whereas CRT TVs use upwards of 1W. All these factors jointly determine the Annual Energy Consumption index (AEC) of a television. Replace your CRT & LCD TV with LED TV and save energy. Turn the TV off from power plug when not in use. Think about the size of the screen – larger screens can consume more electricity than smaller screens. The energy efficiency star rating system in case of refrigerators is based on a metric known as Comparative Energy Consumption (CEC). The CEC is denoted in units of kWh/year. The comparative energy consumption is almost similar to the Annual Energy Consumption metric used in determining the star ratings of televisions. Lower the CEC, higher the star rating and better will be the energy efficiency of the refrigerator. Refrigerators are one of the most used home appliances in our households. These devices are generally used 24x7 to keep the contents inside fresh and edible. Direct cool refrigerators require defrosting the freezer compartment done manually. You have to switch off the refrigerator till the ice inside melts. Frost free refrigerators make use of heating pads inside the freezer to prevent the ice build up. These heating pads require additional current to keep warm, resulting in higher power consumption than direct cool refrigerators. Direct cool refrigerator consumes less energy than frost free refrigerators. The energy efficiency of the refrigerators also depends upon the type of compressors. Inverter compressors are the most efficient type out there, with minimal maintenance and energy consumption. A 4-star refrigerator with an inverter compressor is always better than a 5-star refrigerator with a normal compressor. Since the inverter compressor is capable of variable loads, the power usage will be varied depending on the load inside which is not the case in ordinary compressor powered refrigerators. Another important factor determining the energy efficiency and the subsequent star rating of a refrigerator is its size. Obviously larger capacity refrigerators will require a lot of energy to cool the spacious interiors than a small refrigerator with a single compartment. All these things together make up the comparative energy consumption value on which the star rating is given. Allow the hot food to cool first, then put in the fridge. Do not overfill your refrigerator: Excessive loading of the refrigerator, create trouble in the circulation of cold air inside. Set the refrigerator temperature as per need: Refrigerator set to lower than needed will increase your energy consumption by – 20 to 25 %. Don’t open refrigerator door unnecessarily: Frequently opening of refrigerator door will increase energy consumption by 7%. Clean it regularly: By cleaning up the condenser coil, you can reduce energy consumption by approx. 5%. To get extra saving, go for star labelled refrigerator: Old inefficient refrigerators consume as much as 40% more energy than a five star rated refrigerator. This article concludes here with an elaborate discussion about the star based energy efficiency rating and how it’s calculated. With the main home appliances covered, you can use the tables given above to make sure which star rating should you want. It can save a ton of money for you given the fact that the companies now trick customers to pay more by advertising the star rating jargon. If you have any doubts regarding this post, let’s know in the comment section below. We wish you all the best for your future purchases and have a great day.